Note: Designer background papers and decorative word art shown on samples not included in these layered templates. Text layers included can be used to make your own decorative titles. 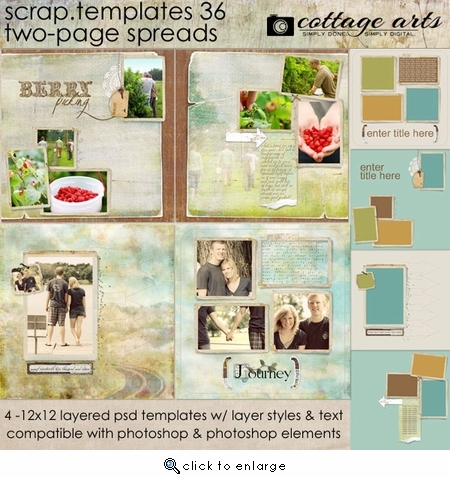 Samples on preview use papers from Simply Friendship and Road Trip Page Paks. 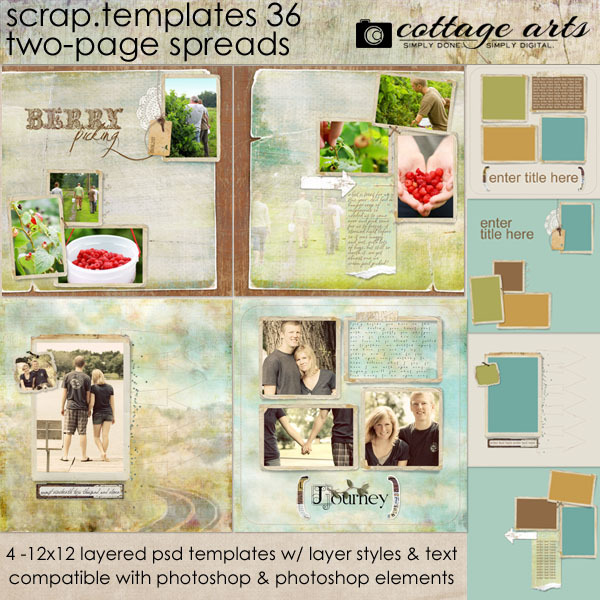 See all of our Scrap.Templates here. Use our Scrap.Template series to speed layout creation by pasting your favorite papers and photos into the different colored shapes (each on their own layer). This set comes with 4 different 12x12 PSD Page Layouts, designed in 2 - 2-page spreads so well suited for photo book and recipe book page creation...shadows (where needed), vintage frames, text layers, masks/blocks, stitching, mats, tags, and other accents. Some elements have custom lifted shadows on separate layers, some have shadow layer styles that can be tweaked to your tastes. Compatible with Adobe Photoshop and Photoshop Elements (will open in Paint Shop Pro...just won't recognize the drop shadow layer styles or text). Can re-size to other sizes and rotate or flip. Re-use elements on other layouts. Instructions included, plus a link to our on-line Clipping Masks tutorial.